Donna M. Bateman’s first book, Deep in the Swamp, highlighted the flora and fauna of Florida’s Okefenokee Swamp using the traditional counting rhyme, 'Over in the Meadow'. In this, her second book, she again takes the familiar rhyme and places it in the Badlands of South Dakota. “Out on the prairie where the snakeroot greets the sun/Lived a shaggy mother bison and her little calf One/”Wallow!” said the mother. “I wallow,” said the One./So they wallowed in the dust where the snakeroot greets the sun.” We read about bison by the snakeroot, pronghorn deer in the wheatgrass, meadowlarks, prairie dogs, grasshopper nymphs hopping in the grama grasses, sharp-tailed grouse where the grass and flowers mix, howdy owls where the yucca grows, rattlesnakes chasing lizards by the primrose blooms, coyote whining where the silver stars shine, and “Great Plains toads jumping through the clover where the moon glows once again.” Back pages includes brief facts about each animal and plant mentioned in the book. The real appeal of Out on the Prairie are the illustrations by Susan Swan. 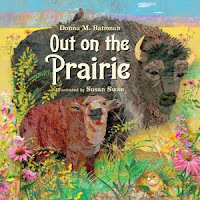 Lots of color and so realistic that readers will almost feel the breeze, hear the chirping of the grasshoppers, and smell the earthy smells of the prairie. Each drawing was created by manipulating found objects, hand-painted papers, and scans of objects and textures in Adobe Photoshop to create new patters, adding digital paintings, and then collaging the two together. This is a great book for story time, units on ecosystems, John Muir, Rachel Carson, and Earth Day. Display it with fiction titles such as Little House on the Prairie by Laura Ingalls Wilder, Incident at Hawk's Hill by Allan W. Eckert, and the excellent nonfiction book, The Prairie Builders written by Sneed B. Collard, a title in the Scientists in the Field series.